Product Details Watch machines go up for sale across the United States with the most trusted name in farm equipment, Machinery Pete! 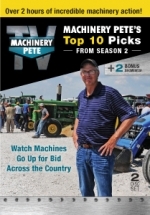 Machinery Pete TV Best of Season 2�takes you across with country with Machinery Pete to see live auction action as farm equipment goes up for bid. Features include antique and classic tractors, high-horsepower machines, and all types of farm equipment. Over 2 hours of incredible machinery action on 2 DVDs.